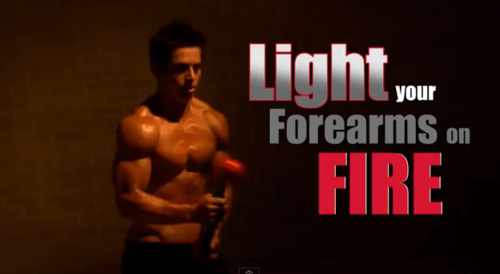 FINALLY the Shake Weight for Men: Free Flexor!! I know my boyfriend has been waiting with eager anticipation for this! And finally it’s here, the Free Flexor! It’s just as questionable as the Shake Weight BUT its for men! Its made out of a solid shaft and two weighted balls at each end. From the look of the video you swing it around in circles (do the helicopter Rich!) I can’t hear the audio cuz I’m at work but I’m sure the dudes that are candidly trying it out are thinking “Oh man, yea I can TOTALLY feel the burn”. Only ten minuets to feel the “entire upper body shock” (hmm it usually takes my man less). It’s only one payment of $39.95! So what the hell are you waiting for? Order now and set your forearms on fire! !